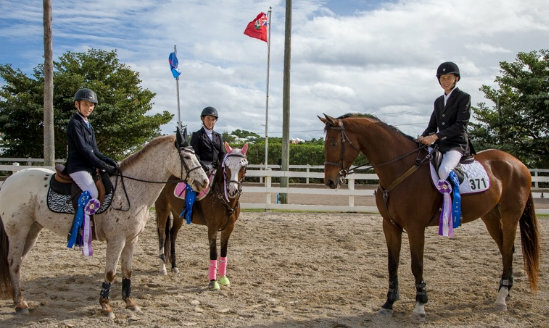 The 2018 Caribbean Equestrian Association’s Regional Jumping Challenge came to very successful conclusion for Bermuda’s Show Jumping riders, as for the third year in a row they claimed the top spot against the Caribbean Teams. The	CEA	RJC	provides	competitors of all ages an opportunity to measure their skills against riders within the Caribbean egion. Riders compete in their own countries over two rounds of a predetermined jumping course at heights	of .70m, .85m or 1.00m. The top scores from each division form	the country’s team. In addition to winning the Team event, Bermuda’s Christian Truran riding De Le Vega was the overall winner in the 1.00m Division with McKenzie James riding Up Up & Away & Casey Truran riding Forza placing 2nd and 3rd respectively. In the .85 Division, Candyce Martins & Crème de Crème secured the overall second placing. Officiating the event was Bermuda’s FEI Judge, Judy Hagen.